Weeks before the Party Congress where his leadership is being challenged, Jardim ups the stakes and presents a global motion which calls for the separation of Madeira from Portugal... if the region is not granted greater (?) autonomy. Jardim has always used the threat of separatism for pure demagogery, saying he did not advocate it but that the policies of his enemies in Lisbon and their 'attacks' on Madeira were stoking up separatist sentiments. He promised to take Lisbon's 'colonial' policies to the UN and so on. His threats have always been part of a political ploy to stir emotions and Jardim himself has never taken these arguments at face value. The difference is this time, in desperation, he has gone beyond insinuating a separatist threat, to actually advocating the possibility of independence. ...But the threat is carried out without conviction and confidence. It is a written threat, lost in pages of a long motion, not one of his violent rants. 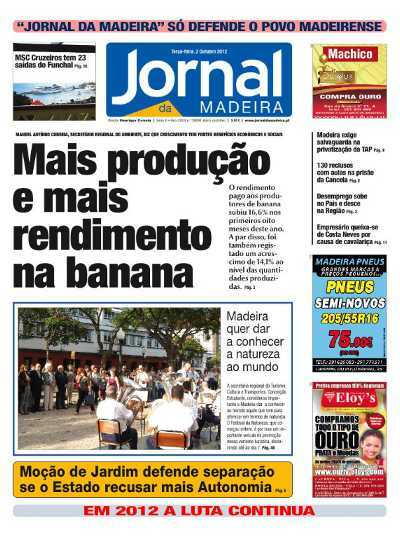 The front page headline in the Jornal is revealing of his loss of direction. The separatist threat is relegated to a small headline at the bottom of the page, while the main headline is the increase in banana production!